Christmas songs or ringtones reflect the joyous spirit of Christmas! As Christmas Day draw near, ever thought to dress up your iPhone with some exciting but free Christmas songs or ringtones? With the spirit of Christmas in mind, Bigasoft has prepared plenty of free Christmas songs for you to download here. Bigasoft also provides an easy solution to set and customize those Christmas songs as free Christmas ringtones for iPhone in the following text. Apple gives you two options to get iPhone ringtones: pay $0.99 for a 30 second ringtone, or choose one of the standard provided iPhone ringtones. So when try to dress up your iPhone with some Christmas ringtones, you have no choice but to pay for it. Fortunately, Bigasoft offers a more flexible and free way to get thousands of personalized iPhone Christmas ringtones: set your personal Christmas songs as Christmas ringtones for iPhone or even make your ringtones longer than 40 seconds. Can't help setting Christmas songs like Jingle Bells, Feliz Navidad, and Christmas tree as free iPhone Christmas ringtones? If you have not Christmas songs in hand, you can download them here. 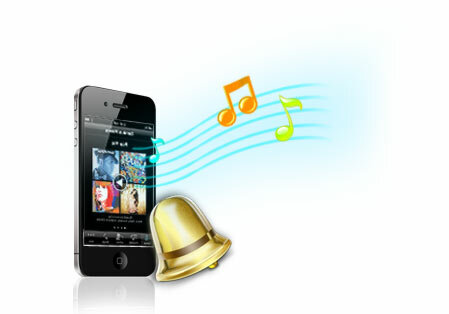 The following will guide you how to set Christmas songs as free ringtones for iPhone. 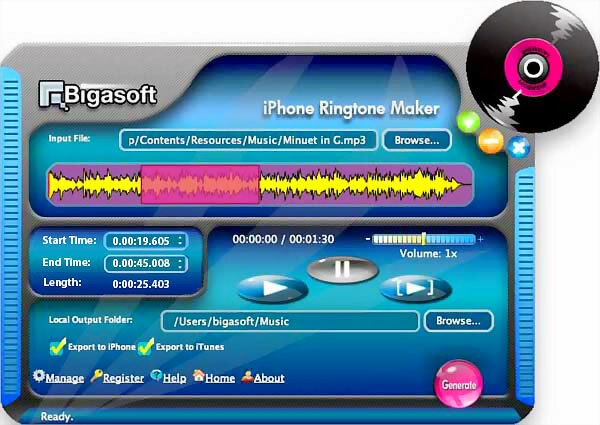 Free download Bigasoft iPhone Ringtone Maker (Windows Version , Mac Version ) install and run it, the following interface will pop up. Connect iPhone to your computer through USB cable. Press "Browse..." button to import Christmas song to Bigasoft iPhone Ringtone Maker. Click "Play" button to listen to the song and find the part of it you want to use as ringtone. And then set the Start Time and the End Time by drag and release on slider to where you want. Check before "Export to iPhone" option, then click "Generate" button. Bigasoft iPhone Ringtone Maker will convert your Christmas song to Christmas ringtone for iPhone and sync to iPhone via USB cable automatically. It is just so easy to get free Christmas ringtone for iPhone!